This mama and her piglet are a special kind of wonderful. They’re being raised by a single mom and her family in a tiny village in one of the remotest parts of rural Qinghai, where the winters are long and cold and grinding poverty is an ever-present reality. These pigs are her ray of hope. As the piglets grow up, they’ll be sold at the local market and and, with the money she earns, she’ll be able to buy food and medical necessities and keep her kids in school so that, one day, they’ll have a brighter future. We need your help to reach more single moms and their families. With Captivating’s PIGS FOR POVERTY program, it costs RMB 1,800 / US$270 to give a family a pair of female breeding piglets specially bred to survive the long, harsh Qinghai winters, money for the first year of vaccinations, and training on the latest breeding methods. On October 14, in Shenzhen China, we host our annual CAPTIVATING CHARITY AUCTION. This is a critical night of fundraising, helping us to achieve our program goals in China. We know not everyone can make it to the auction but are hoping you might still join hands with us from wherever you are in the world. This year, we hope you could get behind this program. You can donate between NOW and midnight October 14. The Chairman of Captivating’s Board believes in this program so much that he is going to match every RMB 900 / US$135 raised up to 100 families before midnight October 14. 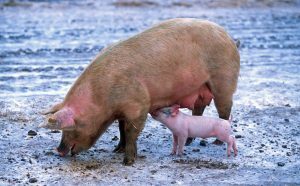 Pigs for 100 single moms and their families. That’s a special kind of wonderful.